According to a recent study by leading market intelligence and consulting firm, iData Research, over 460,000 rotator cuff surgeries per year are performed in the United States. Rotator cuff repairs are the second most common orthopedic soft tissue repair procedure performed. Rotator cuff tears often occur as a result of repetitive use and wear. Most tears occur in people over the age of 40. As that segment of the population continues to grow, the demand for rotator cuff repairs will increase in correlation. The number of rotator cuff repairs is expected to grow at a compound annual growth rate of 4% to surpass 570,000 procedures by 2023. Rotator cuff repairs involve repairing tears in the rotator cuff tendon using suture anchors. These repairs are classified by single row and double row repairs, with double row generally being used for larger tears. Single row repairs consist of two to three suture anchors while double row ranges from four to eight suture anchors per procedure. The surge in popularity for double row rotator cuff repairs has contributed to market growth of the suture anchor market since the procedure uses a minimum of four anchors, compared to the two used in traditional single row repair. Single row repairs were the preferred technique in the past, but double row procedures have since become the standard for rotator cuff repair procedures performed. Although there is no definitive proof that one technique performs better than the other, double row procedures are still experiencing growth at a relatively higher rate. As the number of double row procedures continue to grow, the average number of suture anchors used per procedure will increase accordingly, providing ample revenue for the device market. In 2017, the overall rotator cuff repair market was estimated at over half a billion US dollars, a fairly high increase over the previous year. This market comprises suture anchors of all material types including polylactic acid (PLA) resorbables, biocomposites, polyetheretherketone (PEEK), metal, all-suture and polyetheretherketone carbon fiber (PEEK CF). 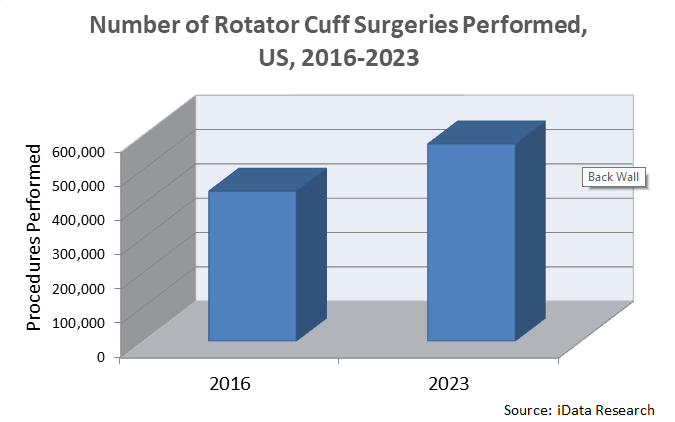 For a deeper analysis of the rotator cuff repair market, the U.S. Market Report Suite for Orthopedic Soft Tissue Repairs provides a comprehensive report on units sold, market values, average selling prices, procedure volumes, forecasts, as well as detailed competitive market shares and analysis of all major competitors. Reports include research for tendon reinforcement grafts, suture anchors, tenodesis screws, ACL/PCL replacement allografts, interference screws, intratunnel fixation devices, cortical fixation devices, cross-pins, washers and posts, osteochondral allografts, meniscal allografts, autologous chondrocyte implantations, particulated juvenile allograft implants, microfracture adjuncts, suture meniscal repair devices, implant meniscal repair devices, hybrid meniscal repair devices, hip radiofrequency probes, banana blades, hip access kits and disposable suture passers.